Summary: Jake was always doing crazy, stupid dares. That was just who he was. Was, because one day his luck ran out, and he died attempting to do a backflip off the top of a swing set. He was even still wearing his graduation gown. Five years later, his little sister Jaycee has just graduated high school herself, but she's never been able to shake the image of seeing him hit the ground. Jake's death has turned her abrasive and reckless, and she's lost much more than just her big brother - she's lost track of herself. 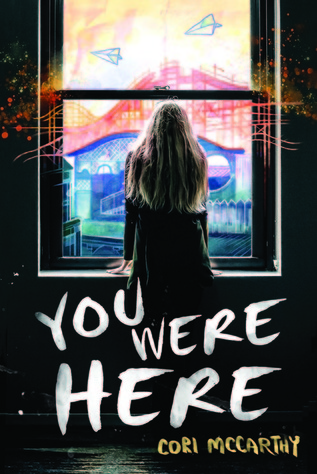 Every year, she and Mik, Jake's best friend, meet up on the anniversary of Jake's death, but this year it's different, because this year she is joined by her ex-best friend Natalie, Natalie's boyfriend Zach, and Zach's best friend Bishop, all of whom are struggling with their own issues. When Jaycee finds Jake's old journal chronicling his urban exploration adventures, they all decide to retrace his steps, Jaycee in an attempt to hang on to her brother, and everyone else in an attempt to hang onto something else. But what they find is not the ghost of their long-dead loved one, but themselves and each other. Thoughts: I found this book to be interesting and unique because it is a mix of words and visual media - the chapters are split between each character, but Mik and Bishop's chapters are different, employing art instead of words. Mik is a selective mute, so instead of getting his narration/inner monologue, his point of view is shown graphic-novel-style. Bishop is an artist working in spray paint on the walls of the abandoned locations they find, so his consist of a single artistic statement - short on words but not on impact. That said, this does not mean that the "regular" chapters are uninteresting - in fact, they are absolutely compelling. This is a story of grief, of love, and of growing up. Each and every character in this group is amazingly drawn (literally and metaphorically), with their own quirks, their own flaws, and their own utter humanity. Sometimes you read a book, and the characters feel so real to you that you actually want to know them. I was really sad when this book was over because I totally wanted more. I have to say that I liked the diversity in this book. Bishop, I think, looked darker-skinned in Mik chapters, and I love that he's the artist working through his broken heart. Natalie, who has a much bigger role, is Asian, and I've rarely seen such a fleshed-out, complex Asian character. No, there isn't anything about Asian heritage - the book doesn't have her eating rice or doing martial arts or anything that obvious - but I saw her as true-to-life because of the pressure she faces about her academic choices, about the internalized snobbery and conflict she feels about her relationship with Zach. These were feelings that were very familiar to me. At one point in the book, she talks about how she has to rush home because she'd already been out all night, and her parents weren't as forgiving as Zach or Jaycee's parents - while strict parenting isn't uniquely Asian, it is generally a big part of the Asian-American-teen experience, to have stricter parents than your non-Asian friends. I know I'm stereotyping, but... hey, I related hard. This story has interesting twists and turns, and there is a ship that you will ship so hard that you won't know what to do with yourself. And moreover, it's an utterly compelling character story about young people who are already dealing with the stresses of being on the cusp of adulthood, but who are also having to deal with grief as well. If you like this sort of thing, I cannot recommend it enough.